Amaze your Valentine this year with our Gourmet Pretzel Twists. Each hand decorated pretzel will delight your loved one with every bite. Celebrate Valentine's Day with our delicious gourmet Hand-Dipped & Decorated Pretzel Twists! 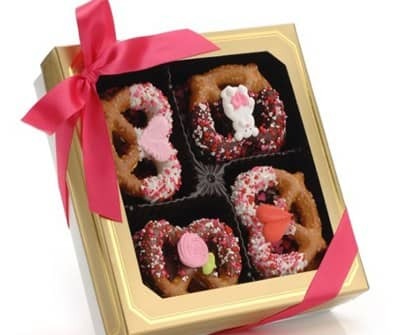 Each crisp, delicious Pretzel Twist is hand-dipped in your choice of Chocolate - Dark, Milk or White or Caramel - hand-decorated with hand-crafted Royal Icing Decorations and yummy Candy Hearts & Sprinkles and individually wrapped in cellophane bags. We heat seal each bag at both ends for freshness and quality. Your pretzels are handpacked in our gorgeous Gold Window with gold Metallic Border Gift Boxes and tied with ribbon. Shelf life 6-9 months. Ideal room temperature 65-72. Keep out of direct sunlight. Keep in airtight container.